When a lady gets to a certain age, we start to sit up and take notice of tubs of expensive face creams. The word anti-ageing is banded about the beauty industry with aplomb, and the pseudo science convinces us of the latest miracle product will make us look ten years younger. Don’t get me wrong, there is some good stuff out there. According to London skin guru Caroline Hirons there are only a few ingredients that have scientific backing for effectiveness (in true dietitian style, scientific evidence is everything). Specific ingredients to look out for include sun protection (SPF), vitamin A/retinol, and glycolic/lactic/salicylic acid. Here are 4 ways to look after your skin……. Smoking – if you do this, and you don’t want to have skin like an old bag. Stop. Simple as. Sun – don’t stick your face in the sun everyday to get a tan (or a ‘tawn’ as we say here in Northern Ireland). Be sensible. A little sun is important for vitamin D, but you can get this from exposing arms and legs for 20 minutes without sun cream. For your face, protect it from the sun. Apparently you don’t necessarily need to use a separate suncream everyday as a lot of moisturisers and foundations have an SPF. Sugar and refined carbohydrates – there had to be a dietary contribution to this post! If you want to reduce the wrinkles, step away from the sugar. In a nutshell, skin damage from the inside may be caused by a reaction called ‘glycation’. This is a process in which collagen fibres (the scaffolding of your face) are reduced in elasticity by losing the cross links between the fibres, leading to wrinkles and lines. Sugar and reined carbohydrates also promotes inflammation in the body, which is not good for the skin. Healthy fats – Essential Fatty Acids are important for a multitude of functions in your body. If you’re not getting enough EFAs in your diet, your skin may be dry, red and more prone to spots. 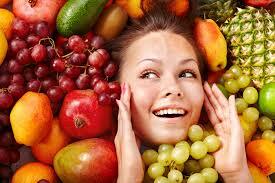 EFAs can improve skin conditions such as psoriasis and eczema. Fats are also needed for your body to absorb vitamins A, C, D and K.
Sleep – this seems like kind of an obvious one, but fundamental to the cause! In a study published in 2015, chronic poor sleep quality is associated with increased signs of ageing, diminished skin barrier function and lower satisfaction with appearance. I have a number of clients who have reported that one of the happy ‘side effects’ of improving their diet has been better sleep: a very unscientific and anecdotal statement for me to make, but worth mentioning. sugars – I’m not saying ‘never’, but keep in check sugar, brown sugar, coconut sugar, honey, agave syrup, glucose, sucrose, dextrose, fructose, corn syrup etc. Yes, unfortunately even the trendy sugars are ‘sugar’. high glycaemic index foods – These are refined carbohydrates which are digested quickly – white breads, white rice, cakes, biscuits, fruit juice, sweet fizzy drinks, energy drinks etc. healthy fats – these are anti inflammatory and help to keep blood sugar levels lower – salmon, mackerel, sardines, flaxseed, walnuts, cashews, olive oil, avocado, pumpkin seeds, sunflower seeds. Here’s a guide to healthy fats. Healthy fats in sensible amounts are good. If you are overweight then go easy on these – have a handful of nuts rather than the bag, one mackerel fillet not three. whole grains – replace refined carbs (generally anything made with white flour or sugar) with wholesome alternatives as these have a lower glycaemic index so keeping blood sugar levels down. Beans, lentils and oats are particularly good. Eat it, don’t lie in it!! species’. So lots of vegetables, the more variety in colour the better…..red cabbage, broccoli, asparagus, avocado, beetroot, kale, carrots, peppers, and spinach. Fruit is good too with top marks for deeply coloured strawberries, blackberries, blueberries, raspberries, plums, apples. Green tea and black tea (builder’s tea). So in a nutshell (excuse the pun!! ), here’s yet another reason fill your boots with loads of colourful veg, some fruit, oily fish, nuts, lentils, beans, and other whole grains. If you need recipe ideas, here you go: recipes. I personally use olive oil and it is the best anti aging oil which makes the skin smooth and clean.Thanks for good advice indeed! Honey is one of the best anti aging skin care products. I really enjoyed reading this post, good info , appreciate it for putting up!